2 bedroom 1 bathroom split-level modern duplex on the Palmera Golf development of Valle del Este Golf Resort which measures 115m² and boasts plenty of outside space, including a rear terrace & garden and spacious roof terrace. 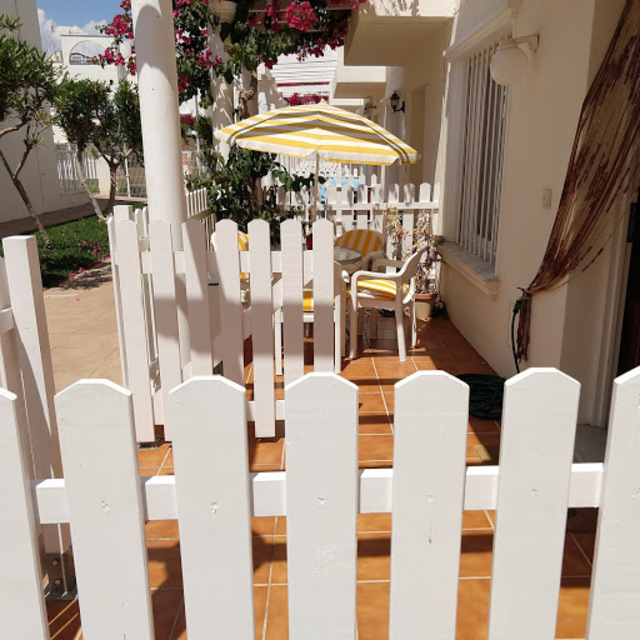 This modern duplex is located on the Palmera Golf urbanization which is just a short walk away from the Valle del Este commercial centre with bars, restaurants and a shop. The property boasts a very generous build size of 115m² with an abundance of outdoor space. Entering the duplex, a small entrance hall leads to a separate W/C immediately on the right. Past this is the fully fitted kitchen with a separate enclosed utility room. Next is the dining area which easily accommodates a 6-seater table & chairs and features a service window into the kitchen. Finally on the ground floor we have the spacious & light living room with access straight onto the rear terrace & well-maintained garden. Both the private and communal gardens are excellently maintained. On the first floor we find the master bedroom with fitted wardrobes and views from the large window overlooking the communal areas. Next is the main bathroom with shower and finally, the 2nd double bedroom, again with fitted wardrobes. The property boasts an extremely private roof terrace which enjoys the sun all day long. The development features two communal pools, private underground parking, a lock up private storeroom and a padel court. This property can be sold as seen, minus personal items, subject to negotiation and has A/C installed in all rooms, as well as ceiling fans in both bedrooms. The property would make an ideal lock-up and leave holiday home but also offers the space if the objective is for more permanent living. The Valle Del Este Golf Resort offers great facilities such as a luxury hotel, an 18 hole golf course, golf club, pro shop, driving range and practice putting area. The hotel also boasts a fitness club and spa treatment centre. Valle del Este also has a commercial centre with bars, restaurants, shops whilst the beaches of Vera Playa & Mojacar are just 10-15 minutes away.